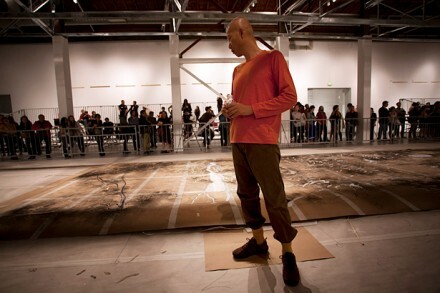 Cai Guo-Qiang in front of Desire for Zero Gravity (2012) at MOCA’s Cai Gu0-Qiang: Sky Ladder. Images via MOCA unless otherwise noted. 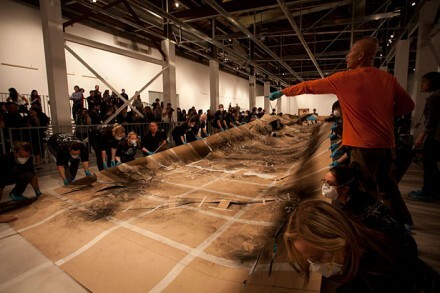 In the first West Coast solo exhibition of world-renowned New York-based Chinese artist Cai Guo-Qiang, the Museum of Contemporary Art, Los Angeles (MOCA) presents four commissioned projects, including the most recent work in the artist’s Projects for Extraterrestrials series, which began in 1989. 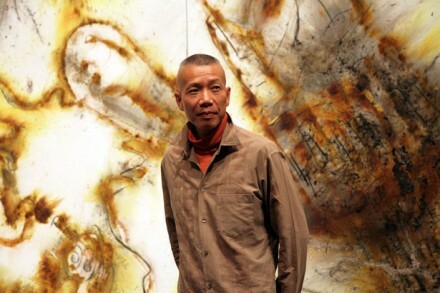 Trained in stage design at the Shanghai Theatre Academy, Cai Guo-Qiang’s projects are spectacular and theatrical gestures, embodying the ethos of action painting and a long history of creation/destruction strategies in terms of today’s complex (pyro)technical mechanisms. Using gunpowder as his medium, Cai creates large-scale drawings in a matter of seconds with the dramatic transformative potentials of this volatile material. 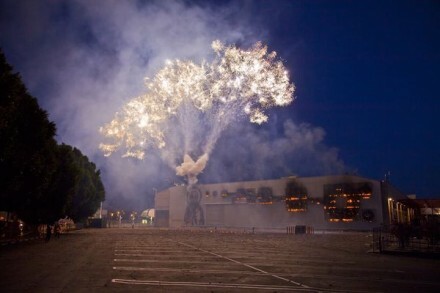 Mystery Circle: Explosion Event for The Museum of Contemporary Art, Los Angeles (2012). Photo on site for Art Observed by Megan Hoetger. As the artist describes in this new film his process connects him to a continuum of human history, revealing his (and all of our) relations to the unseen world and the energy of nature. 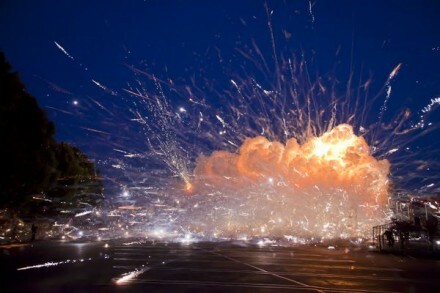 The works in Cai Guo-Qiang: Sky Ladder reflect the artist’s metaphysical longing and desire to find connections to the universe in which the artist lives—both the known and unknown. Undertaken over the course of three days earlier in March (March 5, 7, and 9), the three works on display in the museum (two on canvas, one on Japanese hemp paper) each take up an aspect of nature and our relation to it, reflecting our attempts and, often time, failures to manipulate the environment around us. In Chaos of Nature, the first in the series, Cai depicts the uncontrollable forces of nature, including volcanoes, earthquakes, and tornadoes. In the second, Desire for Zero Gravity, the work shows humanity’s historical attempts to defy gravity, rendering, for example, a hot air balloon or a figure known in Chinese legend for his attempts to fashion human-scale wings. The final piece of the series, Childhood Spaceship, includes representations of technological symbols, which have fascinated Cai since his childhood, such as a typewriter or a hubcap. Through this series of works, we move ever closer to the artist himself—from the events of nature that occur outside of human time, to the experiments that have propelled mankind forward through its history, to the objects that have affected Cai on a personal level. 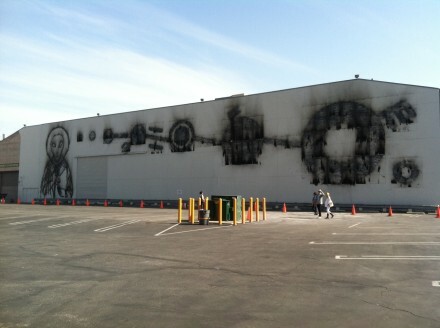 As these works move inward toward the artist’s own history, the massive wall drawing on the north facade of the MOCA building, Mystery Circle: Explosion Event for The Museum of Contemporary Art, Los Angeles, instead, moves outward. Part of the Extraterrestrials series (ongoing since 1989), Mystery Circle is meant to operate at a beyond-human scale. 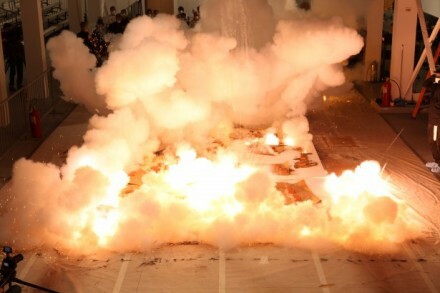 The explosion event at MOCA, held the night of the opening on April 7, 2012, was just that. 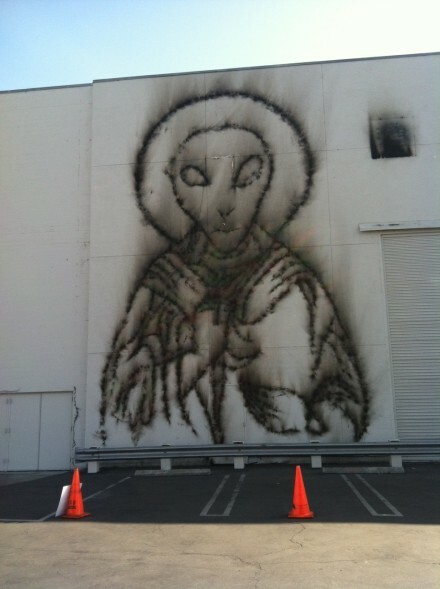 In a performance that included the ignition of approximately 40,000 rocket fireworks set off in a process of four stages, Mystery Circle created in about 2.5 minutes an enormous image of a Christ-like alien figure (the first time such a figure has ever been depicted in Cai’s Extraterrestrial series) alongside a series of crop circle formations. The drawing was echoed inside in Crop Circles, which rendered the symbols of the paranormal activity in a highly-realistic diorama, suspended from the ceiling. 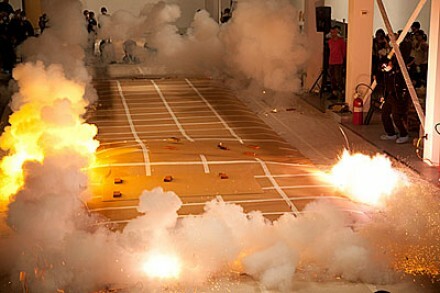 Detail from Mystery Circle: Explosion Event for The Museum of Contemporary Art, Los Angeles (2012). Photo on site for Art Observed by Megan Hoetger. 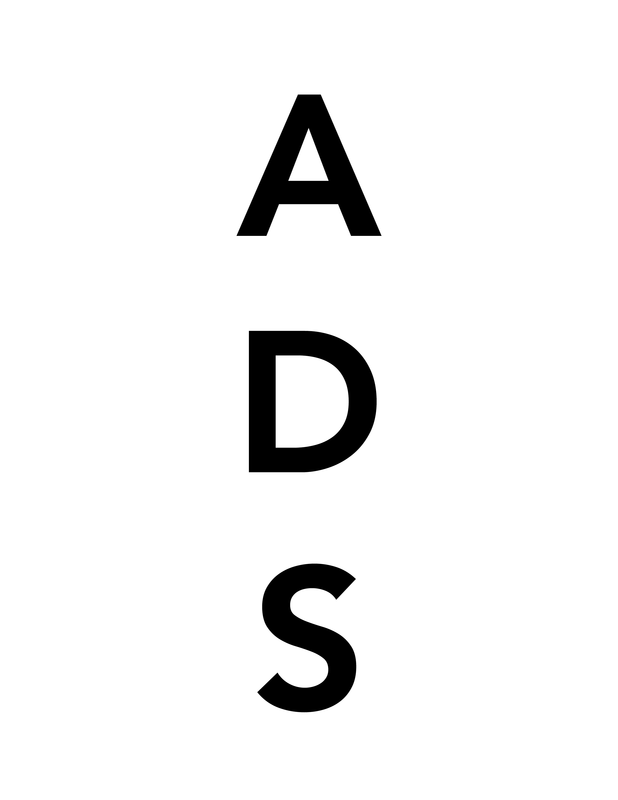 This entry was posted on Thursday, April 12th, 2012 at 12:01 am	and is filed under AO On Site, Art News, Go See. You can follow any responses to this entry through the RSS 2.0 feed. You can leave a response, or trackback from your own site.